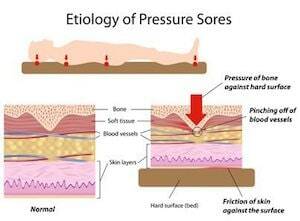 In clinical terms, bedsores are also referred to as pressure ulcers, pressure sores and decubitus ulcers. In most incidences, the bedsore will appear on the skin over a bony prominence like the heel, hip, coccyx (tailbone) or sacrum (a triangular shaped bone located at the base of the spine). However, a bedsore can occur nearly anywhere on the body, even while taking preventative measures. A clinician can also assess the borders of a bedsore to gather evidence on the presence of healing, or the body’s potential to heal. Assessing the skin surrounding the ulcer can help locate the presence of a variety of problems including swelling, hardness, induration (sclerosis), warmth, redness or any sign of infection. In addition, the clinician should assess the pain level of the patient at the site of the ulcer. In many incidences, the patient will suffer some level of pain from minimal to severe. Sometimes, the pain is so severe that it interferes with the patient’s ability to move or function normally. What Causes Bedsores to Develop? Skin tissue has a limit to the amount of pressure it can tolerate. Any excessive pressure, especially over a bony prominence, can result in ulcerated tissue, causing a bedsore. These types of ulcers tend to appear more often on the body’s lower half because of its increased body weight, and the presence of large bony prominences. Pressure ulcers are an all too common problem in nursing homes and assisted living facilities. Whether the bedsore is caused by a medical condition or through neglect by the caregiver, the first visible signs that a pressure ulcer can occur are the same. Reddening reactive hyperemia is usually the first indication that ischemia (a restriction of blood and shortage of oxygen to the tissue) has occurred at the site. Much like a tourniquet being removed from an extremity, blood flow will rush into the tissue when the pressure is released, flushing the skin to a red condition. However, when there is applied pressure in the area for an extended time, reactive hyperemia can fail the body’s need for blood and oxygen, and cause extensive damage to the tissue. The best type of records involving bedsores will be documentation and drawings of the human body indicating the exact location of the pressure ulcer. Clinicians will often use a disposable tape measure to determine the length of the wound in centimeters. In addition, the assessment should include the color, or colors, of the wound along with the depth of the ulcer at its deepest point when inserting cotton tipped swabs or gloved finger. Advanced assessment to prevent bed sores will determine if the ulcer is identified as epithelial tissue, granulation tissue or necrotic tissue. The assessment should also include any odors, drainage characteristics, margins (edges) and noticeable indicators of tunneling. Bedsores are preventable in nursing homes under managed supervisors care and at home. It requires appropriate care provided by the staff responsible for the care and attention of a loved one. When a nursing home fails to provide the basic standards of care, including taking all the necessary steps for preventing bedsores, they can be held liable for all resulting financial damages. If you suspect your loved one has developed bedsores as a resident in a nursing home or assisted living facility, you can file a lawsuit for financial compensation. Nursing Home Law Center LLC can offer legal assistance and take immediate steps to stop the abuse and neglect. Call (800) 926-7565 for a free case evaluation today.